Wirecard launched its mobile payment solution, boon, in France today, allowing iPhone owners to use prepaid virtual credit cards in their Apple Pay wallet. Launched in the U.K. in May of last year, boon is independent of any bank and offers a pre-paid account with a digital MasterCard that users can top up via wire transfer, debit or credit card. The moble payment app works at any NFC-enabled terminal where the MasterCard contactless logo appears. "By launching boon with Apple Pay in France, even more users in Europe can experience a new level of mobile payments without being a customer of a specific bank. Thanks to its ease of use and maximum security standards, boon is a state-of-the-art payment solution", said Georg von Waldenfels, Executive Vice President Consumer Solutions with Wirecard. Users who want to pay with the mobile app boon outside of France, can upgrade to the level "boon. PLUS" which has a maximum top-up limit of 5000 euros and does not include any additional costs. 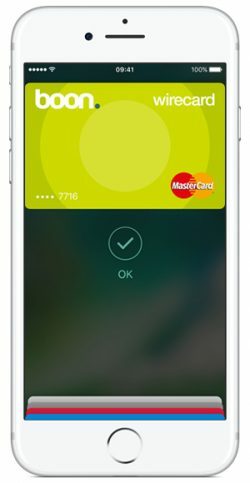 Apple Pay became available in France in June of last year, with cards issued by Banque Populaire, Ticket Restaurant, Carrefour Banque, and Caisse d'Epargne available for use on eligible devices. The boon app is a free download from the App Store for iPhone and iPad. Why are bank transfers not at least 15 minutes fast? All background checks for a transfer are, as I said, automated anyways. 1 day means if you're lucky and the transfer is PROCESSED by the recipient that following day you're looking at buying things "spontaneously" after planning a day ahead. Well, I can only speak for Germany, but things are more complex in the background. The German clearing house for SEPA transfers is the Bundesbank and they have operating hours from the morning until the afternoon. They are colecting all batch transfers from all connected banks in a round based scenario and distribute the results to all connected banks afterwards. While most background checks are automated, a hit for certain criterias must result in a manual process in the compliance department, this is legally required. The transfer time is mainly an issue created by the clearing house, not the banks. SEPA rules clearly state that a transfer must not take longer than t+1 if handed in to the clearing house the same day (afaik before 4pm). There is a concept for SEPA instant payments that will be in place within the next two years. The real challenge is the support for legacy systems that are really old and can only work with batch transfers. You can download the app from the French App Store. a) I don't want another Apple ID just to get a feature a little earlier. The less banks I have to deal with the better! I'm on the same boat, i doubt that apple will bring any soon Apple Pay in Germany. Why are bank transfers not at least 15 minutes fast? - Come up north. :) All Danish banks support instantaneous transfers 24 hours a day, 7 days a week.